A sweeping war drama depicting the tribal warfare of ancient horse nations of the Carpathian region, R.F. 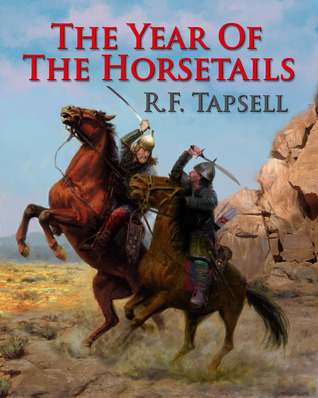 Tapsell’s The Year of the Horsetails (first published by Hutchinson & Co., 1967) is a gem for readers who are interested in military history, military strategy, and the daily life of the steppe warriors before Europe’s borders were drawn on any map. The author seems to be an authority on the topics of weaponry, social structure, and clashing cultures of the long-ago era: massive research and enormous knowledge anchors the novel. The plot spans over an entire year in the life of the main character, Bardiya, a Saka warrior thrown by fate from one exotic culture to another. We meet him when he is a fugitive from the cruel and barbaric Tugar Kagan. Surviving the escape by his outstanding combat skills and pure luck, he lands in the foreign and somewhat disdained culture of the agriculturally inclined town-dwellers of the Drevich people. Soon Bardiya establishes his diplomatic connections and becomes the military leader of the Drevichi against the nomad experts of steppe warfare, unstoppable conquest, and unrelenting invasion: the Tugars. The title (The Year of the Horsetails) is very appropriate: the plot describes one tumultuous, adventure-filled year in Bardiya’s life. The number of horsetails signify the rank of an officer in the nomad army, seven being the highest rank, that of the Kagan, ruler of the steppe. Tapsell’s historical knowledge shines through every line of the novel, yet it proves to be a double-edged sword. There is a fairly sharp learning curve for the reader. The first half of the book is excruciatingly slow with seemingly unending narration written in archaic, very formal English, peppered with intimidating paragraphs that contain sentences with numerous foreign names, technical terms, and military references: “Yarosh was rather surprised, until he was told that Bregnits was full of Drevich leaders and fugitives. Then he saw that there were other troops camped outside the town. Bardiya, Yarosh and Mrad rode into Bregnits with Dragesh’s messengers.” (p.59, para 3 and 4.) Even though the narrative is rich with detailed and accurate history, after 60 pages the value of it starts to fade, and both comprehension and attention suffer. Omniscient point of view attempts to balance the dryness of the narration, but the “show, don’t tell” policy still seems to be missing. Nonetheless, I urge the reader to get over the first half of the book in order to experience an exceptional literary and historical feat. The classically structured plot presents gradually rising tension, which results in an action-filled page-turner by the time you reach the second half of the novel. Tapsell’s book apparently has been published several times since 1967. I applaud this latest edition (published by CnPosner Books, 2013) for the sheer effort of bringing a well-loved, classic historical novel back into the limelight. For the modern reader, a glossary would be extremely beneficial, along with inside illustration to accompany Daniel O’Leary’s beautifully composed cover art. Thank you for this review. PLease note that a glossary of names and terms is included in the new Kindle edition. Great. I wish you the best.